There are two ways to run Waves plugins on your Avid VENUE S6L console: With SoundGrid Rack for VENUE, enabling plugin parameter control from the S6L's encoders and a simple system setup, or via MADI, utilizing the DiGiGrid MGB I/O and Waves MultiRack on an external computer host. 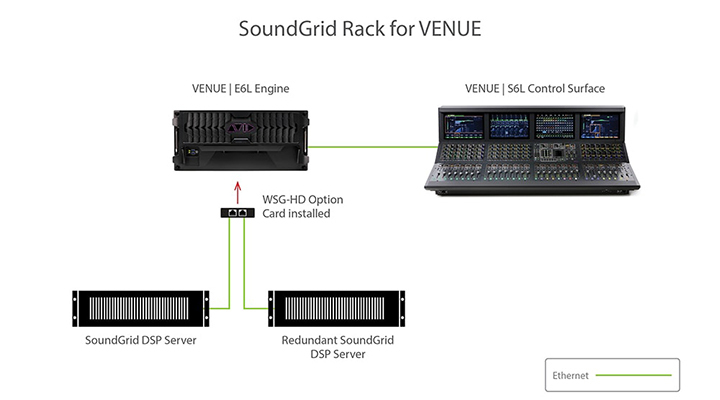 SoundGrid Rack for VENUE contains two software components: SoundGrid Rack and SoundGrid Inventory. SoundGrid Rack is a plugin that runs within the VENUE S6L environment and loads up to 8 SoundGrid-compatible Waves plugins per instance. All standard VENUE plugin features apply, including Config and Show modes, delay compensation, snapshot automation, and more. SoundGrid Inventory manages your SoundGrid network and allows you to monitor its status. In addition to SoundGrid Rack for VENUE, you’ll need the WSG-HD Waves SoundGrid Option Card (purchased separately from Avid), VENUE software version 5.7 or later, a Waves SoundGrid server to process plugins (you can add a second server for redundancy), and Waves plugin licenses of your choice. This focused, powerful setup supports up to 128 mono or 64 stereo SoundGrid Racks – each with up to 8 plugins – and is a viable, easy-to-use solution for the most grueling live sound demands. 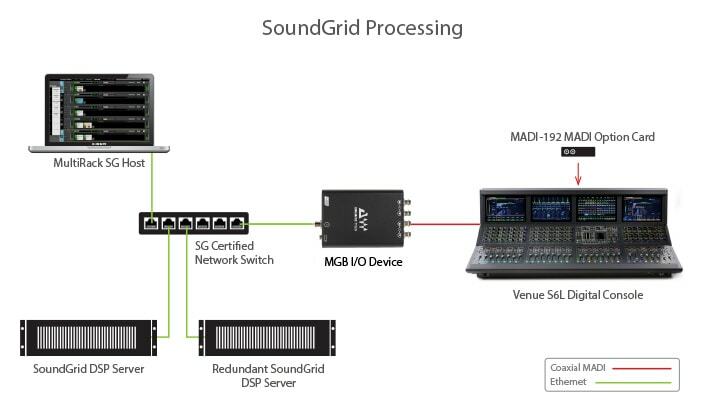 Plug your VENUE S6L console into the power of the Waves SoundGrid processing platform using the MADI-192 MADI Option card and the DiGiGrid MGB audio interface. You’ll be able to process 128 audio channels with hundreds of Waves and third-party SoundGrid-compatible plugins, in real time and with super-low latency of 0.8 milliseconds. Simply plug DiGiGrid MGB into your computer via a network switch, add a SoundGrid DSP server, and run your plugins on the MultiRack SoundGrid host application. If needed, a simple configuration change will switch the DiGiGrid MGB to 96 kHz for 64 channels of plugin processing and recording. Waves does not support AAX DSP or Venue S3L consoles at this time. Although Waves products v9.6 or later no longer support the TDM format, there are a number of Waves plugins which can still be used on legacy VENUE systems. To see which plugins can be used, see compatibility chart. For downloads, installation & activation instructions, see here. With Avid VENUE-series consoles, external processing racks are a thing of the past. It’s a revolution in the world of live sound mixing: a state-of-the-art environment that delivers unprecedented reliability and maximum flexibility for today’s most demanding live mixers and engineers. Compressors, equalizers, reverbs, limiters, vintage models, and more: take your favorite Waves SoundGrid plugins from the studio to the stage. Instead of miles of cables and complex wiring, everything is right there—in the box. Want that compressor post-EQ? A different reverb? Just drag it on over. Feel like fiddling with dozens of knobs and sliders? Go ahead. Or, you can set up your mix, save it, and open it up anywhere, instantly, and make changes on the fly, without ever leaving the sweet spot. No more blown fuses, power supplies, noisy faders, or ground hum. Save processing chains and settings per song. Use different processing on each song to give each its own character. Best of all, transfer Pro Tools mixes from the studio to the stage, tune by tune, track by track. Rack after rack of hardware? Heavy, cumbersome, and expensive to transport, setup, and move around. With Waves and Avid VENUE, all you need are your related Waves installers and licenses on a standard USB Flash Drive, and your rig is everywhere you are. Imagine your favorite EQ. Or that rare studio compressor. Now imagine having as many of them as you want. With Waves and Avid VENUE, you’ve got ‘em! Want to try a clean EQ, or one with character? Switching out components is as easy as pointing and clicking. And rare gear that would rarely leave the studio, like SSLs Fairchilds, and API components are right there, in all their modeled analog glory.